Unassuming movie-goers, who lined up outside a Pleasant Hill theater to watch "Rogue One: A Star Wars Story" on Tuesday, had no idea that Princess Leia actress Carrie Fisher had just died. Fisher's death was announced mid-morning. She suffered a massive heart attack on a Friday flight from London to her home in Los Angeles. She was 60 years old. Another "Star Wars" aficionado, John Grobbel, was in disbelief. "It’s just a shame, she was too young. I was a big fan of the 'Star Wars' series, and you know it's too bad. I pray for her family," he said. Meanwhile, Sonja Avallone said "Star Wars" has amassed a passionate multi-generational following — as evidenced by the children, teenagers and adults who visited the Yoda statue at Imagination Park in San Anselmo — so people of all ages will feel Fisher's loss. 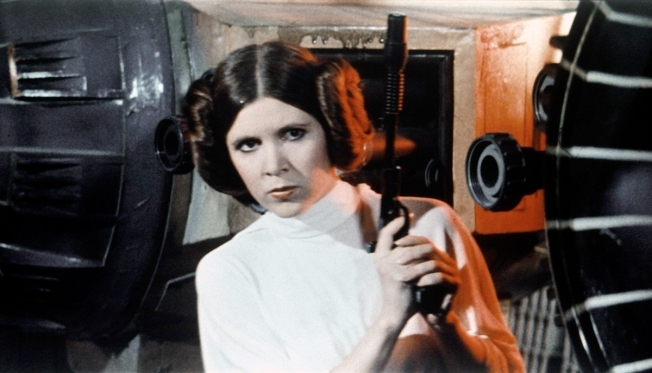 "I’m a 'Star Wars' fan for sure, and I grew up with it , and my kids grew up with it, so it’s really sad," she said. A medic on board Fisher's flight attempted to help the actress, but said she was unresponsive for nearly 15 minutes on Friday. Hospitalized at the Ronald Reagan UCLA Medical Center, Fisher was believed to be in stable condition based on information shared by her brother. Fisher — and her unforgettable braided buns — found lasting fame, with the 1977 release of George Lucas' "Star Wars: Episode IV - A New Hope." Her untimely death sent shock waves through the film community. Mark Hammil, known for his portrayal of Luke Skywalker, said on Twitter that he was "devastated." Fisher's mother, actress Debbie Reynolds, wrote on Facebook: "Thank you to everyone who has embraced the gifts and talents of my beloved and amazing daughter. I am grateful for your thoughts and prayers that are now guiding her to her next stop. Love Carries Mother."